Just imagine this: a friend gives you a ring to look at. She tells you that it has been in her family for generations. Suddenly, your mind is filled with images. Births and marriages, lovers and deathbeds, infants and the aged. You describe the images and your friend looks at you in shock. Everything you said was part of her family history. How could you have known? This wasn't luck. It was an actual skill called psychometry. And as with all skills, you can do exercises to improve it. 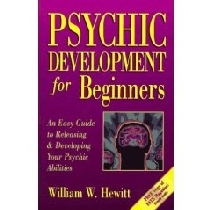 Now you can learn how to enhance this ability and many others in William W. Hewitt's Psychic Development for Beginners. Using more than 25 examples and 44 easy but potent mental exercises, you'll learn to develop all of your psychic abilities. Psychometry is just one of them. Other skills you'll learn include psychic healing, telepathy (mental communication with others), clairvoyance, communication with the spirit world, prophecy, astral travel and creative visualization. Psychic abilities can be very practical, too. The book explains how to use your psychic abilities to develop a psychic alarm clock that can wake you up at any time you desire, keep you from falling asleep at the wrong time, or even help you find a parking place.